Hey Love: School's Out For Summer! Hey lovelies! 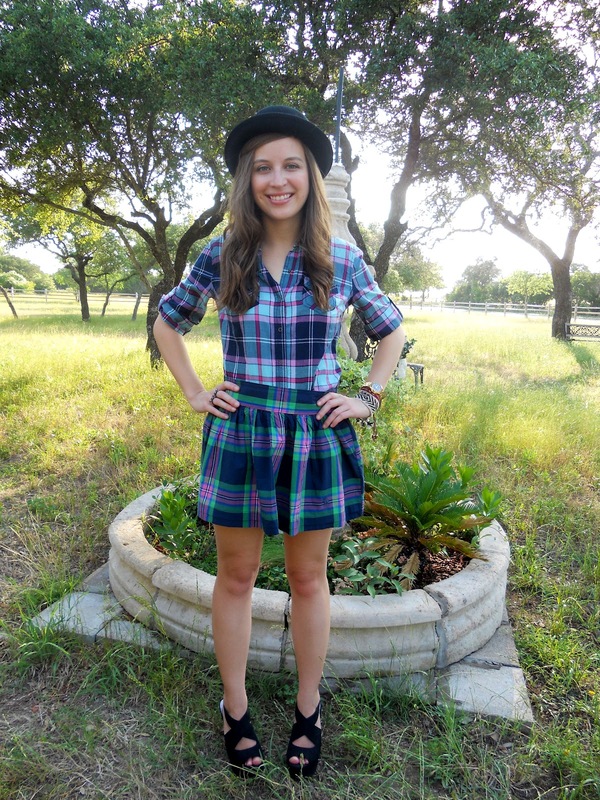 The plaid skirt I'm wearing in this post makes me want to start singing Alice Cooper's song "School's Out" out loud! It seriously played over and over in my head while I was taking my outfit pictures! I went to a public school where we had a really strict dress code---you know I love fashion---but every time I couldn't buy something because it wasn't 'up to par' made me wish we had school uniforms. It would have made things much easier! i love all that plaid! i love the print on print combination, very cool. your shoes are gorgeous and loving the scenery! I love the plaid on plaid! Great idea! I wore a school uniform. It does make life super easy in the morning- that is for sure! But once I got to wear regular clothes to school I did not miss the plaid or the knee socks or the little neck tie thing I had to wear! Love how you matched these patterns, cute outfit! Thanks for stopping by my blog! Would you like to follow each other? I'd hate having a strict dress code for school/work, it's so limiting! I really like how you're wearing your hat. it compliments your outfit! Cute plaid print ad I love that fedora! And I am happy to have found your blog! I absolutely love your style...and that maxi skirt in your last post. AMAZING!! You look cool, I love your gold watch! Cute outfit, your shoes are awesome gotta love wedges. I used to go to a school that wouldn't let us wear anything fun either they considered fashion distracting but what was really distracting was how slobby all the teachers dressed! Your hat is so stinking cute! Love the plaid! That skirt is sooo cute! I love your whole look--and just added the Alice Cooper song to my playlist! Love the plaid!!! I definitely think school uniforms would make life easier. lurv ur shoes, lovely outfit. p.s. thanks for the comment!!! i'm loving your blog more and more each day! I love the mixture of plaids! And the hat is awesome!! Love the skirt and the wedges! Really cute! Love all the plaid! That's a super cute skirt. PS - I think you would look ADORBS with bangs! Dooo it! :o) I cut my bangs in January for a fresh start for the year. I'll admit, there are days I hate them but most of the time I'm in love. love the mix of plaids. you look ADORABLE! Love this plaid mixture, it's so fun and refreshing! 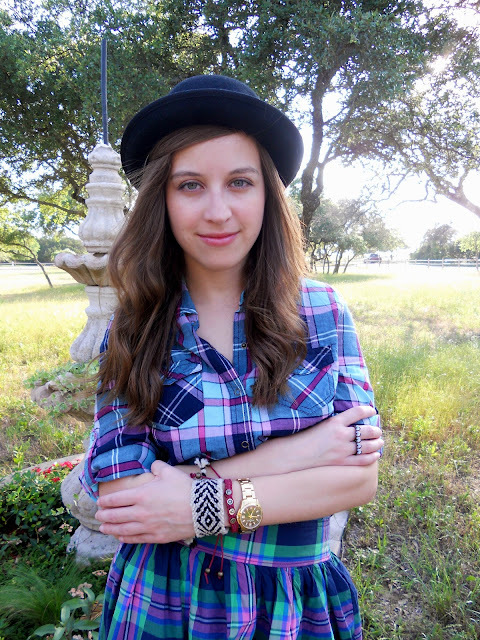 Love, love, love the plaid pattern mixing! I can't wait to give it a try myself, you look fantastic! Keep in touch and have a good weekend! You look great, this look could totally pass for the lead singer of some Brit rock band. What a great pairing. I love how the plaids complement each other without matching. So cute! nice blog what abt follow each other.? Very cute! Love the mixed plaids! Cute! it looks like a dress almost!